After your Millennial marketing content strategy is in place, you should take full advantage of Twitter’s advertising platform. Because Twitter data doesn’t zero in on Millennials like it does on Facebook, you should access your Twitter advertising dashboard and begin promoting specific tweets. You should also start running targeted campaigns geared toward Millennials. 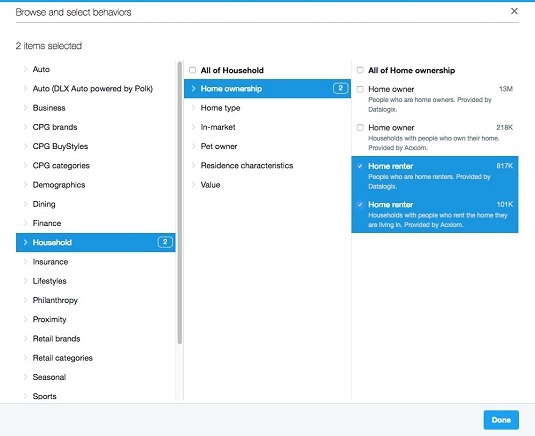 Access your Twitter Ads dashboard and create a new free campaign. The button to create a new campaign appears in the top right-hand corner of the screen. Select the campaign type you’d like to run. You can run several kinds of campaigns on Twitter. Each one is constructed to either drive engagement or performance. Choose the locations where you’d like to reach Millennials. Identify locations where you’d like your ads to be seen. Begin by selecting a series of interests. Remember that you’re building a Millennial mindset audience that isn’t rooted in age, so interests and behaviors are the most important considerations. Though the two criteria are largely interchangeable, interests have a slight edge over behaviors because they’re more indicative of the levels of engagement your target audience has when faced with certain types of content. Here, you can see some examples of the interests list from which you can choose. They can include interests such as automotive, business, gaming, health, movies, technology, and several dozen more. Next, focus on behaviors that fit your target user. This step is where you can target the socioeconomic status of Millennials. In this image, you can see choices as they relate to home ownership. Select accounts that users follow on Twitter and/or choose keywords they’ve used. If you like, you can consider choosing followers and keywords that match your content and voice, which allows you to get specific in your targeting. Being specific ensures that the rhetoric you’re using fits with terms they’ve used in the past. Tweet engagements: Select a series of tweets that have been shared or created for the campaign to promote within your selected users’ feeds to drive up engagement. Video views: Increase views of a native video with a targeted group of users. Website visits/conversions: Drive clicks to or conversions on your website with populated previews of the selected landing page, making your tweet more visible. App installs/re-engagements: Drive up installs of your app directly from Twitter or get users to re-engage with your app when they haven’t opened it in some time. Followers: Build your follower base with a very specific selection of criteria. Leads on Twitter: Collect user data from targeted Twitter users interested in finding out more about your product, service, or offer. Awareness: Raise awareness of your brand and your message on a cost-per-thousand-impression basis. Keep your messages short. Tweets are short to begin with, but the shorter your tweet, the higher the likelihood it catches the eye of your audience. It may sound counterintuitive, but the reality is that Millennials tend to skip over longer tweets and messages and read those that are short and to the point. If you can get your message across in fewer than 140 characters, do it. Studies have shown that the ideal length for a tweet is roughly 100 characters. You should aim to hit that number without compromising the focus of your message. Avoid mysterious or ominous tweets. If there is one thing that Millennials don’t have time for, it’s guessing games. The click-to-reveal approach to marketing and advertising may have worked with previous generations, but Millennials have plenty of other content and media to get to. The majority of your Millennial audience will completely ignore any tweet or a link that doesn’t clearly state what it is. Address a problem and offer a link to the solution. Showcase your product or service in your message and clearly indicate why it’s of value to your target audience. Highlighting the benefits of clicking on a link or sharing data will lead to a much more intent-driven level of engagement. Include graphics that help explain your point. The graphic you choose should help build your message. If your tweet is sending users to an eBook, an image of the cover is ideal. If you’re an auto parts dealer and you’re promoting a sale on mufflers, showcase a muffler in your image. This advice may seem like common sense, but all too often a generic image or a quirky image that does little to complement the tweet is used. That’s a wasted opportunity. Avoid the overuse of hashtags. Simply put, one hashtag is more than enough. Unless you have a particular reason for the use of a hashtag, it doesn’t have a place in your ads. Hashtags today are much more useful for tagging specific events or topics. If your tweet features the word marketing, don’t put a hashtag in front of it. That is a dated practice, and the abundance of hashtags screams spam to any Millennial user. Tailor your message to your targeted audience. Take the time to develop content tailored to the characteristics you’ve identified. Personalization is the name of the game when it comes to Millennials, so get as personal as possible with your content.